Texwipe’s CleanFoam ® Swab Series is constructed from the highest quality 100 ppi polyurethane foam. Complete thermal bond construction eliminates adhesive contamination. Cleanroom processed, providing low levels of non volatile residues (NVRs) and ions, and made to exacting and consistent tolerances using high-precision automated processes. Lot coded for traceability and quality control. Packaged in a silicone-free and amide-free bag. Foam Series B features 500 swabs per bag. CleanFoam® swab for cleaning small slotted and grooved areas. 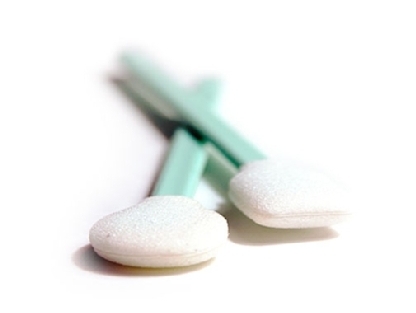 CleanFoam® swab for cleaning surfaces and hard-to-reach areas. For use in cleaning with solvents such as IPA, applying lubricants and other liquids and removing excess materials. CleanFoam® swab for cleaning small and confined areas.